Click on "hide" to hide models. 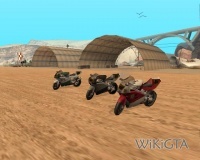 The NRG-500 is a very fast bike in GTA San Andreas. The abbreviation NRG is derived from "energy". It has three different designs and the NRG-900 in GTA IV seems to be a new model of this bike. You'll find the bike in Easter Basin, San Fierro, where it is used to do the NRG-500 Challenge. It will also appear in front of the Bike School if you complete all school challenges with gold. This page was last modified on 4 May 2010, at 15:31.